Most riding jackets are available in 'regular' or 'tall' (or long) sizes, and better quality jackets may also come in a 'short'. 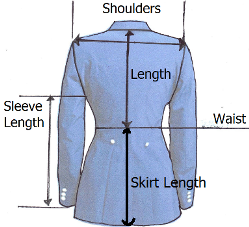 This refers to the length from the collar to the waist - not the overall length. It is critical that the waist of the jacket is in line with the waist of the rider, and a tall rider does not always require a 'tall' coat. 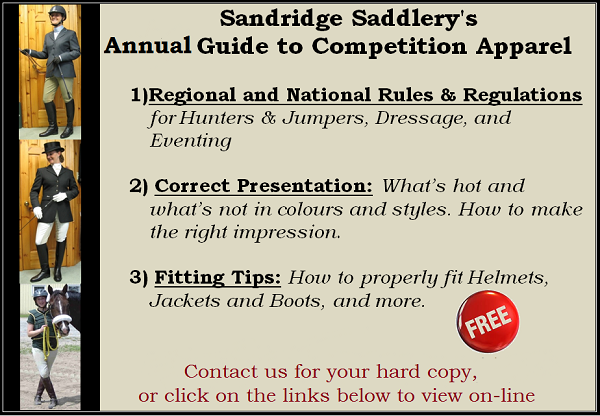 For hunters, jumpers and equitation, the bottom of the skirt normally comes to about an inch below the widest part of the rider's bottom, but shorter jackets are being seen as well. Dressage jackets are a couple of inches longer, and the tails of a shadbelly may reach the back of the knee while standing. In the hunter ring and formal jumper classes, the sleeves should finish just below the rider's wrist bone. Riders wear a long-sleeved shirt with about an inch of the cuffs showing. While you should not be restricted in the shoulders when you move your arms forward to jump, it is natural that the jacket will be tighter, and it is important that the jacket stays smooth across the back of the rider. Dressage sleeves do not need to be as long as the arms are not reaching forward in the same way. Some jackets can be ordered with some customization, such as sleeve or skirt length, larger bust, etc., and remember that even an inexpensive jacket can be made to look quite presentable with a minor alteration or two.